*Information from Tone it Up Quinoa is the edible seed of a plant that from the Andes region of South America. It looks and tastes a lot like more common grain varieties even though it's actually more closely related to beets and spinach! We like quinoa because it is a complete protein source and makes a perfect gluten free substitute for other cereal products. To cook 1 cup quinoa, start by thoroughly rinsing the seeds. Place them in a saucepan with 1&1/2 cups of water. Let the quinoa soak for about 5 minutes. This will help it cook more evenly. Bring the water to a boil. Reduce to a simmer and cover. Cook for about 13 minutes or until all the water has evaporated, stirring occasionally. Remove from heat, fluff and serve. minutes or until lightly browned on both sides. Lightly steam the Collard Leaf until soft. Cook quinoa according to the instructions above. For 1/4 cup Quinoa use 3/4 cups water. tomatoes and avocado slices, squeeze lime juice over all ingredients. Wrap up burrito Style to serve! -If you’d like, top with a little bit of fresh salsa! 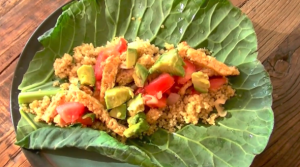 Tip: You can double or triple this recipe to feed more people! 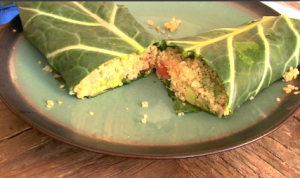 You can also make this recipe with a whole wheat wrap instead of the collard or replace the tempeh with chicken, tofu or fish if you aren’t concerned with making it gluten free or vegan.